Villa Da Simento is a vibrant, traditional Sicilian villa, offering a rustic idyll away from the bustle of the crowds within fragrant, private grounds. Set within a tranquil nook with its drive. Villa Da Simento is a vibrant, traditional Sicilian villa, offering a rustic idyll away from the bustle of the crowds within fragrant, private grounds. Set within a tranquil nook with its drive, behind elegant, wrought-iron gates, this mustard toned home with its sloping roofs imbibes the local style. An imperial styled, rather regal open plan living and dining space offer chic, whitewashed interiors accented with bright crimsons and opulent touches; glittering chandelier and ornate ornamentation. Guests will note the beautiful, large windows and abundance of natural light, in this comfortable, yet luxurious, space - finished with gilded oil paintings and polished timber furniture. These well proportioned, bright spaces, are brimming with character, local charm and artefacts while not being cluttered or fussy. Antiques and lavish decorative touches are offset by the neutral palette and sleek, polished floors. There is a sumptuous, farmhouse style kitchen, offering a traditional touch along with all contemporary fittings; a separate dining “salon” adorned with lavish, salmon-toned chaise longue and porcelain lamps, crystal tableware and oil paintings. The bedrooms are tranquil, minimal and offer unparalleled peace; one twin bedroom with accents of fresh lemon yellow, and two doubles - simple, chic rooms with ornate touches and a nod to the local style; each has its bathroom. Six guests will enjoy a restorative nights sleep in these restful spaces. A glorious private pool glistens within its terrace, offering ample space for lounging or reclining with a good book and a cold beer, while the verdant shade of the trees rustles in the background — the backdrop of luscious olive trees and woodland creating a shady antidote to the dazzling pool-side sun deck. Set on the hillside, guests will also soak in the specular views from the upper terrace, overlooking the rugged, rustic scenery; there is ample space with elegant parasol and dining furniture for leisurely meals al fresco. Imagine sitting back with morning coffee and fresh pastries after a refreshing morning swim; or a glass of local wine in the evening as the sun sets over the rolling hillside, amid terracotta potted flowering plants. Villa Da Simento is a rustic, charming idyll, a haven of luscious original charm set in a woodland location within its own very private and secluded grounds - guests will delight in this little slice of unspoilt Sicily, within a characterful and indulgently traditional set-up! 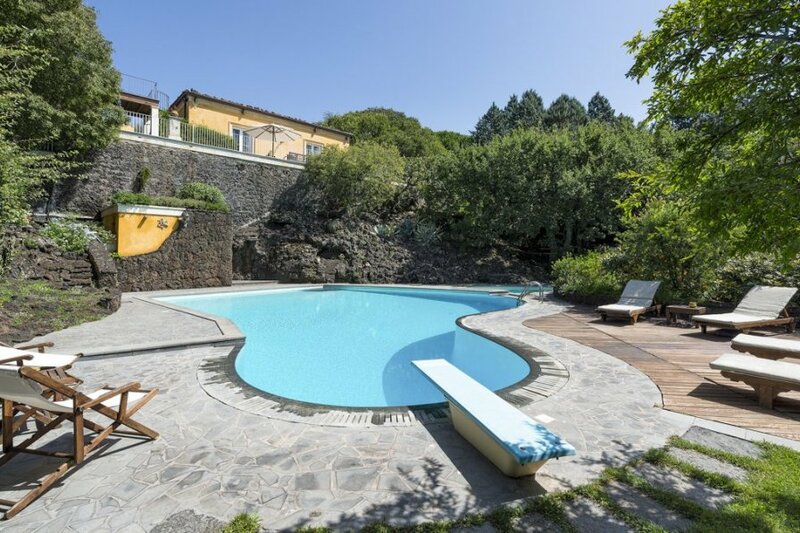 Set within the Eastern part of the island, Villa da Simento is in the foothills of the world famous Mount Etna - the oldest recorded active volcano in the world. Nestled just outside Catania (which is where the nearest airport is), this home benefits from the best of a rural location with proximity to a buzzing city. Catania is an ancient port city on the coast. The city is dripping with history and cultural interest; the wide central square, Piazza del Duomo, features the whimsical Fontana dell'Elefante statue and richly decorated Catania Cathedral. The Palazzo Biscari represents a beautiful example of Catanese baroque architecture and contains a large archaeological collection. History buffs will be impressed by the rococo style interiors, stylish decorations and sophisticated crystal chandeliers. Whether it be Benedictine monasteries, the vivacious fish market which is one of the most emblematic sites of the city, or the kiosks of Catania, this historical city is brimming with cultural interest, bustling local life and opulent historical buildings. The thermal baths and spas are at the foot of Etna, while the famous “Kiosks of Catania” are a hub of local life, dating back to the 1800's; the most famous of which are in Piazza Umberto, a stone's throw from the fero o'lune, the market of Catania.